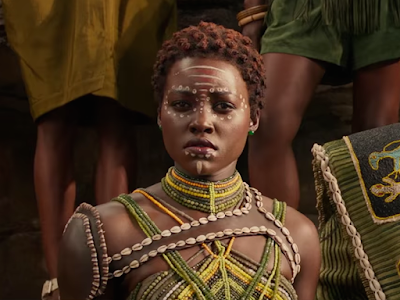 Lupita Nyong'o is suiting up to fight for Africa once again, only this time she'll be playing one of the real-life inspirations for Black Panther's amazing Dora Milaje. Nyong'o and Viola Davis will star in The Woman King, which will have them as members of the Dahomey Amazons, the lethal all-female military unit in West Africa. The film is based on an original story by actress Maria Bello, who will also be producing alongside Davis. Inspired by true events, the story takes place in the Kingdom of Dahomey, a powerful state in 18th & 19th century Africa. Davis will play Nanisca, a general in the all-female fighting force, while Nyong'o is her daughter Nawi. Together they fight the French and neighboring tribes that threaten to enslave them and destroy everything they've lived for. Presumably, Bello got the idea from Nawi, who is believed to be the last living member of the Dahomey Amazons. She died in 1979 having claimed to have fought the French in 1892, who would disband them and turn the kingdom into a protectorate.